Here’s something that you don’t see too often. 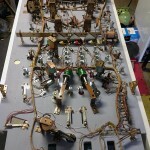 A reproduction EM playfield. 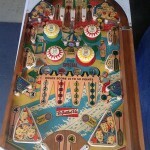 This one is for a 1967 Gottlieb Sing Along reproduced by Wade Krause. It’s great to see some EM love. 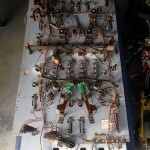 It was my job to do the playfield swap. As with every swap I do, every one gets new posts, rubber, plastics (if available), flipper rebuilds, new lamp sockets, and all hardware reconditioned. 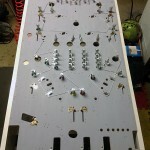 This essentially makes it brand new playfield ready to drop in and play. This one turned out fabulous. 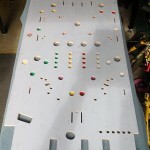 Brand new playfield ready for the swap. Lamp sockets and wire braid installed. 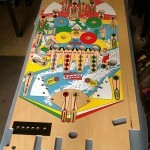 This is the new playfield installed. New plastics weren’t available at the time the swap was done. Apron and upper arch to be done at a later date. 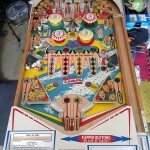 This entry was posted in Playfield Swaps and tagged em, gottlieb, playfield, sing along, swap by Pinball Shark. Bookmark the permalink.